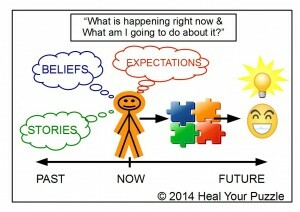 Heal Your Puzzle » Blog Archive » Does your Puzzle Fit Together? Does your Puzzle Fit Together? Have you ever felt like you did not have all the information you needed to make a decision, that you did not have all the pieces of the puzzle in front of you? This could be about something significant or even just about what to buy in your weekly shop. Sometimes the easiest decisions seem difficult… and sometimes the most significant seem easy… But why? WHAT AFFECTS YOUR ABILITY TO DECIDE? In the moment when a decision is needed, you will access your database of experience (your memories); you will remember and compare similarities with your present circumstances. You may be aware of this process but this referencing will not only be taking place in the Conscious Mind, most of the comparisons in fact will be happening in the Sub-Conscious and in the deeper levels of the Super-Conscious. The deeper and more widespread the thoughts about a situation, the more information will be associated with it and the greater its influence on you. BELIEFS – These are thought patterns that have been remembered and retraced many times. Each time you have confirmed and reinforced the pattern with your experience and your Belief has been strengthened. You accept it as True and Real. EXPECTATIONS – These are your Beliefs about the Future. STORIES – These are how you have stored your understanding and interpretation of your Past and these will help form and support your Beliefs. How each of these, your Beliefs, Expectations and Stories, fit together will affect your decision-making ability. The greater the conflict between them, the greater the task of deciding anything. AND WHAT ABOUT ‘YOU’? THE ‘CONSCIOUS YOU’? What happens when… you don’t want to follow the patterns of the Past? …you start to question the validity and benefits of your Beliefs? …you are fed up with the same old Story repeating itself? When these questions start being asked, the ‘Conscious You’ is said to be ‘waking up’… there is an inner realisation that you are not your Past and that in any moment You can choose your own responses. But what happens to all the stored heritage in your Mind? Unfortunately it does not just disappear and each of us will need to find our own way of reshaping and rearranging the puzzle pieces in such a way that works for us.